Sunflower Therapies is a stockist of the ‘next generation’ Oscar Juicer – Oscar DA 1000. An Oscar juicer is superior to all other centrifugal and single gear juicers. The new Oscar DA 1000 juicer is the latest Oscar Juicer. It can perform a multitude of tasks including juicing, grinding, ice cream making, pasta and noodle making and more. It comes with a twenty year motor warranty, a five year juicer head warranty and our one month money back satisfaction warranty. No clogging, no noise, just healthy juice packed with living enzymes for vitality. Low noise, easy cleaning and continuous juicing making for a whole new juicing experience – you’ll notice the difference in the taste of living juice. What Is the Oscar DA 1000? A Fruit Juicer – efficiently cold-press juicing soft and hard fruits. 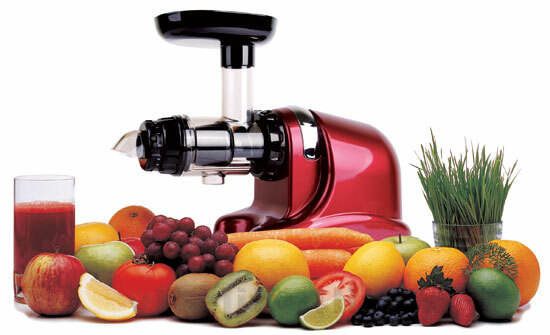 A Vege Juicer – fresh taste and full nutrition are guaranteed with its unique cold pressing extraction process. A Wheat & Barley Grass Juicer – including wheat grass, aloe leaves and pine tree needles. A Food Processor – providing no-loss nutrition from many different foodstuffs. Soft foods can also be minced for baby meals. A Pasta Maker – make fresh pasta in minutes with the pasta nozzles included in the pack. An Ice Cream Machine – combine your favourite frozen fruits and process through the Oscar DA 1000 for instant no-added-sugar fruit ice cream that children (and big people) love. As with the Oscar 900 this juicer is designed to last and comes with a substantial home-use warranty of 20 years for the motor and an increased 10 years for the parts. Full details and warranty card enclosed with the Juicer. The Oscar DA 1000 includes the parts required to make nut butters, frozen fruit ice-cream, baby foods, pasta, gourmet dips & tapenades and much more. With the Oscar, the pulp is expelled from the front of the juicer, creating a continuous juicing action. No clogging, no noise, just healthy juice packed with living enzymes 🙂 The New Oscar DA 1000 also features a pulp adjusting knob meaning you can now control the pressure inside the machine. This feature has only previously been available on the expensive twin gear machines. This means the Oscar DA 1000 puts you in control of crushing and squeezing the cellulose wall of the cell releasing maximum enzymes and nutrients into the juice. Tagged detox, juicer. Bookmark the permalink.